Cities: Capital: Juba. Other cities — Aweil, Malakal, Yambio, Torit, Wau, Bentiu, Bor. Terrain: Mainly grasslands, wooded and grassy savannahs, floodplains, and wetlands. Generally flat with some high-altitude plateaus. Climate: Tropical, hot, and humid with seasonal rainfall influenced by the annual shift of the Inter-Tropical Convergence Zone. Rainfall is heaviest in the upland areas of the south and diminishes to the north. Nationality: Noun and adjective (sing. and pl.) — South Sudanese. Population (2008 census): 8,260,490. Of this, 4.29 million are male, and 3.97 million are female. More than half of the population (51%) is below the age of 18, and 72% of the population is below the age of 30. Ethnic groups: Dinka, Kakwa, Bari, Azande, Shilluk, Kuku, Murle, Mandari, Didinga, Ndogo, Bviri, Lndi, Anuak, Bongo, Lango, Dungotona, and Acholi. Religions: Christian, traditional, and Muslim. Languages: English (official); Arabic (includes Juba and Sudanese variants); Dinka, Nuer, Zande, Bari, Shilluk, Otuho, Luwo, Moru, Mandari, Didinga, and Toposa. Education: Net enrollment rate  (2010) — 44% (primary school); 63% of the population above the age of 6 years has never attended school. Literacy — 15 to 24 years old (40%); adult (total 27%; males 40%; females 16%). Health: Infant mortality rate: 102/1,000 live births. Maternal mortality rate — 20.54/1,000 live births. Immunization rate — 17% of children are fully immunized. Work force: By occupation: subsistence agriculture and animal husbandry 78%. *Source: National Bureau of Statistics Key Indicators for South Sudan. Independence: July 9, 2011 (from Sudan). Branches: Executive: president (head of state and head of government) and vice president. Legislative — bicameral legislature consisting of 332-seat National Legislative Assembly and 50-seat Council of States; members serve 4-year terms. Judicial — Supreme Court, Courts of Appeal, High Courts, and County Courts. Administrative subdivisions: Ten states; elected governors, state cabinets, and elected state legislative assemblies. Political parties: The Sudan People's Liberation Movement (SPLM) is dominant. Other political parties include the African National Congress, National Congress Party, South Sudan Democratic Forum, SPLM for Democratic Change, Sudan African National Union, United Democratic Front, United Democratic Salvation Front, United Democratic Salvation Front-Mainstream, and United Sudan African Party. Central government budget (FY 2011 est. ): $2.097 billion. Security (FY 2011): $591.7 million. Economic growth rate (2012 proj., Government of South Sudan): 7.2%. Natural resources: Oil reserves (immediately lucrative), hydropower, fertile agricultural land, gold, diamonds, hardwoods, limestone, iron ore, copper, chromium ore, zinc, tungsten, mica, and silver. Agriculture: Products: sorghum, maize, rice, millet, wheat, gum arabic, sugarcane, mangoes, papayas, bananas, sweet potatoes, sunflowers, cotton, sesame, cassava, beans, peanuts, cattle, and sheep. Trade: Major trading partner: Sudan. South Sudan is estimated to be the seventh-largest country in Africa and is bordered by Central African Republic, Democratic Republic of the Congo, Ethiopia, Kenya, Sudan, and Uganda. The country is divided by the White Nile River, which flows north out of the uplands of central Africa. During the annual floods of the Nile River system, South Sudan's Sudd area is inundated. This large, swampy region of more than 100,000 sq. km dominates the center of the country and supports agriculture and extensive wildlife populations. South Sudan has a population of over 8 million and a predominantly rural, subsistence economy; approximately 83% of the population is rural. There are 10 states: Central Equatoria (population 1,103,592), Eastern Equatoria (906,126), Jonglei (1,358,602), Lakes (695,730), Northern Bahr el Ghazal (720,898), Unity (585,801), Upper Nile (964,353), Warrap (972,928), Western Bahr el Ghazal (333,431), and Western Equatoria (619,029). Except for an 11-year hiatus before the CPA was signed in 2005, South Sudan was embroiled in conflict with the central authorities in pre-south independence Sudan following Sudan's 1956 independence, resulting in major destruction and displacement since the end of colonial rule. South Sudan continues to cope with the effects of conflict, displacement, and insecurity. The country has many tribal groups and languages, and its people practice indigenous traditional beliefs, Christianity, and Islam. Over 90% of the population identifies themselves as Christian. South Sudan and Sudan were a collection of small, independent kingdoms and principalities from the beginning of the Christian era until 1820-21, when Egypt conquered and unified the northern portion of the country. However, neither the Egyptian nor the Mahdist state (1883-1898) had any effective control of the southern region outside of a few garrisons. South Sudan remained an area of fragmented tribes, subject to frequent attacks by slave raiders. In 1881, a religious leader named Muhammad ibn Abdalla proclaimed himself the Mahdi, or the "expected one," and began a religious crusade to unify the tribes in western and central Sudan. His followers took on the name "Ansars" (the followers) led by a descendant of the Mahdi, Sadiq al Mahdi. In February 1953, the United Kingdom and Egypt concluded an agreement providing for Sudanese self-government and self-determination. The transitional period toward independence began with the inauguration of the first parliament in 1954. With the consent of the British and Egyptian Governments, Sudan achieved independence from the Anglo-Egyptian condominium on January 1, 1956, under a provisional constitution. This constitution was silent on two crucial issues for southern leaders — the secular or Islamic character of the state and its federal or unitary structure. However, the Arab-led Khartoum government reneged on promises to southerners to create a federal system, which led to a mutiny by southern army officers that launched 17 years of civil war (1955-72). South Sudan and Sudan were at war for more than three-quarters of the period from 1956 to 2011. Protracted conflict rooted in deep cultural, ethnic, and religious differences slowed economic and political development and forced massive internal displacement of people. In 1958, General Ibrahim Abboud seized power and pursued a policy of Arabization and Islamicization throughout the Sudan that strengthened southern opposition. General Abboud was overthrown in 1964 and a civilian caretaker government assumed control. Southern leaders eventually divided into two factions, those who advocated a federal solution where all people would be treated equally and allowed to participate in their government's affairs, and those who argued for self-determination, a euphemism for secession since it was assumed the south would vote for independence if given the choice. Until 1969, there was a succession of governments that proved unable either to agree on a permanent constitution or to cope with problems of factionalism, economic stagnation, and ethnic dissidence. These regimes were dominated by "Arab" Muslims who asserted their Arab-Islamic agenda and refused any kind of self-determination for the people of South Sudan. In May 1969, a group of communist and socialist officers led by Colonel Gaafar Muhammad Nimeiri seized power. A month after coming to power, Nimeiri proclaimed socialism (instead of Islamism) for the country and outlined a policy of granting autonomy to the south. Nimeiri in turn was the target of a coup attempt by communist members of the government. It failed and Nimeiri ordered a massive purge of communists. This alienated the Soviet Union, which withdrew its support from Sudan. Already lacking support from the Muslim parties he had chased from power, Nimeiri could no longer count on the communist faction. Having alienated the right and the left, Nimeiri turned to the south as a way of expanding his limited powerbase. He pursued peace initiatives with Sudan's hostile neighbors, Ethiopia and Uganda, signing agreements that committed each signatory to withdraw support for the other's rebel movements. He then initiated negotiations with the southern rebels and signed an agreement in Addis Ababa in 1972 that granted a measure of autonomy to the south. Southern support helped him put down two coup attempts, one initiated by officers from the western regions of Darfur and Kordofan who wanted for their region the same privileges granted to the south. However, the Addis Ababa Agreement had no support from either the secularist or Islamic northern parties. Nimeiri concluded that their lack of support was more threatening to his regime than lack of support from the south, so he announced a policy of national reconciliation with all the religious opposition forces. These parties did not feel bound to observe an agreement they perceived as an obstacle to furthering an Islamist state. The scales against the peace agreement were tipped in 1979 when Chevron discovered oil in the south. Northern pressure built to abrogate those provisions of the peace agreement granting autonomy to the south. In 1983, Nimeiri abolished the southern region, declared Arabic the official language of the south (instead of English) and transferred control of southern armed forces to the central government. This was effectively a unilateral abrogation of the 1972 peace treaty. The second Sudan civil war began in January 1983 when southern soldiers mutinied rather than follow orders transferring them to the north. In September 1983, as part of an Islamicization campaign, President Nimeiri announced that traditional Islamic punishments drawn from Shari'a (Islamic law) would be incorporated into the penal code. This was controversial even among Muslim groups. Amputations for theft and public lashings for alcohol possession became common. Southerners and other non-Muslims living in the north were also subjected to these punishments. In April 1985, while out of the country, Nimeiri was overthrown by a popular uprising in Khartoum provoked by a collapsing economy, the war in the south, and political repression. Gen. Suwar al-Dahab headed the transitional government. One of its first acts was to suspend the 1983 constitution and disband Nimeiri's Sudan Socialist Union. Elections were held in April 1986, and a civilian government took power. There were tentative moves toward negotiating peace with the south. However, any proposal to exempt southerners from Islamic law was unacceptable to those who supported Arabic supremacy. In 1989, an Islamic army faction led by General Umar al-Bashir mounted a coup and installed the National Islamic Front. The new government's commitment to the Islamic cause intensified the north-south conflict. The Bashir government combined internal political repression with international Islamist activism. It supported radical Islamist groups in Algeria and supported Iraq's invasion of Kuwait. Khartoum was established as a base for militant Islamist groups: radical movements and terrorist organizations like Osama Bin Laden's al Qaida were provided a safe haven and logistical aid in return for financial support. In 1996, the UN imposed sanctions on Sudan for alleged connections to the assassination attempt on Egyptian President Hosni Mubarak in Addis Ababa, Ethiopia. Meanwhile, the 1990s saw a growing sense of alienation in the western and eastern regions of Sudan from the Arab-dominated center. The rulers in Khartoum were seen as less and less responsive to the concerns and grievances of both Muslim and non-Muslim populations across the country. Alienation from the "Arab" center caused various groups to grow sympathetic to the southern rebels led by the Sudan People's Liberation Movement/Army (SPLM/A), and in some cases, prompted them to flight alongside it. The policy of the ruling regime toward the south was to pursue the war against the rebels while trying to manipulate them by highlighting ethnic divisions. Ultimately, this policy resulted in many rebels' uniting under the SPLM/A leadership of Colonel John Garang. During this period, the SPLM/A also enjoyed support from Ethiopia, Eritrea, and Uganda. The Bashir government's "Pan-Islamic" foreign policy, which provided support for neighboring radical Islamist groups, was partly responsible for this support for the rebels. On November 19, 2004, the Government of Sudan and the SPLM/A signed a declaration committing themselves to conclude a final Comprehensive Peace Agreement (CPA) by December 31, 2004, in the context of an extraordinary session of the United Nations Security Council (UNSC) in Nairobi, Kenya — only the fifth time the Council had met outside of New York since its founding. At this session, the UNSC unanimously adopted Resolution 1574, which welcomed the commitment of the government and the SPLM/A to achieve agreement by the end of 2004, and underscored the international community's intention to assist the Sudanese and South Sudanese people and support implementation of the CPA. In keeping with their commitment to the UNSC, the Government of Sudan and the SPLM/A initialed the final elements of the CPA on December 31, 2004. The two parties formally signed the CPA on January 9, 2005. The U.S. and the international community welcomed this decisive step forward for peace. The 2005 CPA established a new Government of National Unity and the interim Government of South Sudan and called for wealth sharing, power sharing, and security arrangements between the two parties. The historic agreement provided for a ceasefire, withdrawal of troops from South Sudan, and the repatriation and resettlement of refugees. In addition, it stipulated that by the end of the fourth year of an interim period there would be elections at all levels, including for national and South Sudan president; state governors; and national, South Sudan, and state legislatures. The CPA also mandated that a referendum be held no later than January 2011, giving southerners the opportunity to vote either for unity within Sudan or separation, and that a parallel referendum be held for the people of Abyei to determine whether they wish to remain in the North or join the South. On July 9, 2005, the presidency was inaugurated with al-Bashir sworn in as President and John Garang, SPLM/A leader, installed as First Vice President of Sudan and President of the Government of Southern Sudan. Ratification of the interim national constitution followed. The constitution declared Sudan to be a "democratic, decentralized, multicultural, multiethnic, multireligious, and multilingual State." On July 30, 2005, Garang died in a helicopter crash. The SPLM/A named Salva Kiir, Garang's deputy, as First Vice President of the Government of National Unity and President of the Government of South Sudan. Provisions of the CPA that were implemented included the formation of the national legislature, appointment of cabinet members, establishment of the Government of South Sudan and the signing of the interim South Sudan constitution, and the appointment of state governors and adoption of state constitutions. The electoral law paving the way for national elections was passed in July 2008. Laws governing the South Sudan and Abyei referenda and the popular consultations in Southern Kordofan and Blue Nile were passed in December 2009, and the parties agreed in February 2010 to begin demarcation of the north-south border. With the establishment of a National Population Census Council, a southern Sudan population census was conducted in April/May 2008 in preparation for national elections. The results from the census were released in early 2009. Elections took place from April 11 to April 15, 2010 and were largely peaceful. However, there were widespread irregularities reported during the polling and counting periods, as well as serious restrictions on political activities in both north and south leading up to and during the elections. The National Congress Party (NCP) and SPLM won the overwhelming majority of the electoral races, and incumbent presidents were elected for the Government of Sudan and the semi-autonomous Government of South Sudan. The CPA mandated that a referendum be held no later than January 2011, giving southerners the opportunity to vote either for unity within Sudan or separation, and that a parallel referendum be held for the people of Abyei to determine whether they wished to remain in the North or join the South. On January 15, 2011 the week-long unity or cessation South Sudan referendum concluded, and official results were announced on February 7, 2011. More than 3.85 million people — or 97.58% of registered voters — participated, with 98.83% voting for secession according to the final results. During the February 7, 2011 announcement ceremony, the Government of Sudan thanked the international community and issued the following statement: "In accordance with the Comprehensive Peace Agreement (CPA) and the Constitution of 2005, we accept the referendum result, and we renew our commitment to building constructive relations with the new state in the South." On the same day, President Barack Obama congratulated the people of South Sudan, and announced the United States' intent to formally recognize South Sudan as a sovereign, independent state in July 2011. In a separate statement on February 7, 2011, Secretary of State Hillary Clinton congratulated all of Sudan, and signaled the United States would initiate the process of withdrawing Sudan's state sponsor of terrorism designation. On July 9, 2011 the Republic of South Sudan became an independent state — the 193rd country in the world and the 54th member of the African Union. A transitional constitution took effect the same day and provides for executive, legislative, and judicial branches. The transitional constitution calls for the establishment of a representative National Constitutional Review Commission to conduct a national consultation, gathering views from communities and stakeholders across the country. The resulting draft permanent constitution would be presented to a National Constitutional Conference for consideration. During more than 20 years of conflict between the Government of Sudan and the Sudan People's Liberation Movement/Army, violence, famine, and disease killed more than 2 million people, forced an estimated 600,000 people to seek refuge in neighboring countries, and displaced approximately 4 million others within Sudan, creating the world's largest population of internally displaced people. As of 2008, the UN estimated that nearly 2 million displaced people had returned to South Sudan and the three areas of Southern Kordofan, Blue Nile, and Abyei following the 2005 signing of the CPA. In 2009, interethnic conflict in the Jonglei, Upper Nile, and Lakes states killed more than 2,000 people and displaced approximately 250,000 individuals. As of late 2009, the UN estimated that Lord's Resistance Army (LRA)-related violence had displaced approximately 85,000 people in South Sudan, including more than 18,000 refugees from Democratic Republic of the Congo and Central African Republic. As of late 2011, the UN estimated that over 380,000 people were displaced across South Sudan, Democratic Republic of the Congo, and Central African Republic as a result of LRA activity. The Republic of South Sudan maintains an embassy (http://www.gossmission.org/goss/) in the United States at 1233 20th Street NW, Suite 602, Washington, DC 20036. Subsistence agriculture and animal husbandry provide a living for the vast majority of South Sudan's population. Fifty-one percent of the population lives below the poverty line, and 1% of households in have a bank account. The country has received more than $4 billion in foreign aid since 2005, largely from the U.K., U.S., Norway, and Netherlands. 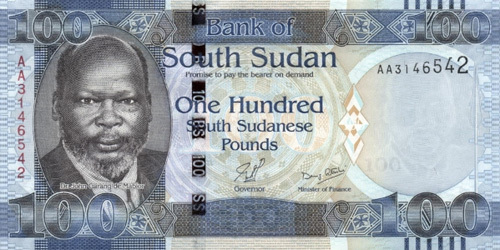 The Government of South Sudan expects 7.2% economic growth in 2012. South Sudan produces nearly three-fourths of the former Sudan's total oil output of nearly a half million barrels per day. The government derives almost 98% of its budget revenues from oil. Oil is exported through two pipelines that run to refineries and shipping facilities at Port Sudan on the Red Sea. A 2005 oil-sharing agreement with Khartoum called for a 50-50 sharing of oil revenues between the two entities, but that arrangement expired on July 9, 2011 when South Sudan became an independent country. The country depends heavily on imports of goods, services, and capital from Sudan, but disruptions in trade have occurred since independence due to blockades being imposed on goods and capital going to South Sudan. There are more than 7,000 formal businesses in South Sudan's 10 state capitals (84% of which are restaurants or shops). Sudan was the first country to recognize South Sudan's independence. The parties achieved some agreement on the citizenship of southerners in the north, and on the principles and management structure for a demilitarized border zone. However, several post-CPA issues — including oil management and the status of Abyei — remained unresolved. The parties continue to work through these issues, and the United States remains actively engaged through its support of the African Union High Level Implementation Panel (AUHIP) and its chairman, former South African President Thabo Mbeki. Although the boundaries of the Abyei area were defined through arbitration in The Hague in July 2009, and both Sudan and South Sudan accepted the arbitration decision, issues persist and the Abyei boundary has not been demarcated. On June 29, 2011, the Government of Sudan and the Government of South Sudan signed an agreement in Addis Ababa on border security arrangements in which they agreed to establish a Safe Demilitarized Border Zone and to stand up the Joint Political and Security Mechanism before July 9. The agreement requested Ethiopian troops from the UN Interim Security Force in Abyei (UNISFA) to provide protection for international border monitors, and invited the African Union and UN to provide support for monitoring and verification within the border zone. South Sudan became a member of the United Nations on July 14, 2011. The Security Council established the UN Mission in the Republic of South Sudan (UNMISS) in July 2011 to consolidate peace and security and to help establish conditions for development. 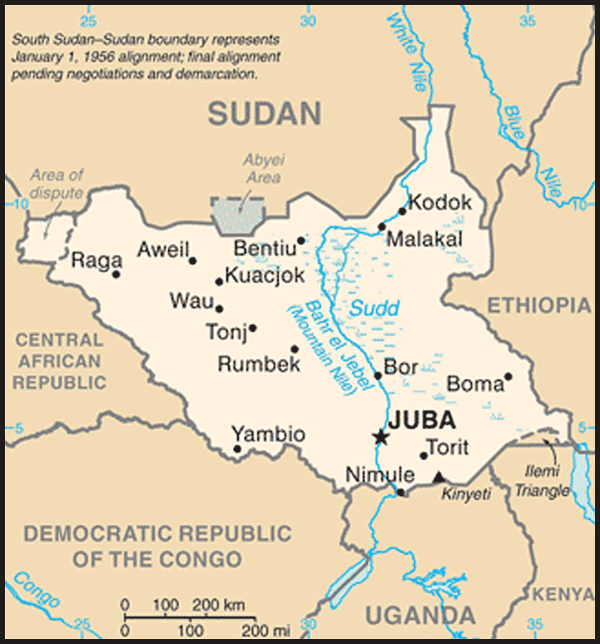 The United States recognized South Sudan as a sovereign, independent state on July 9, 2011. The U.S. Government is the leading international donor to South Sudan and Sudan. It contributed more than $10 billion in humanitarian, development, peacekeeping, and reconstruction assistance for the people in Sudan and eastern Chad since 2005. The United States also is the largest provider of humanitarian assistance to Lord's Resistance Army-affected populations in South Sudan, Democratic Republic of the Congo, and Central African Republic, contributing more than $18 million in FY 2011 to support food security, humanitarian protection, health, and livelihoods initiatives for internally displaced persons, host community members, and other affected populations. U.S. Embassy Juba web site: (http://southsudan.usembassy.gov/).